This is analogous to frequency f, which is the reciprocal of period T; that is, f = 1/T. In a sense, period can be thought of as a temporal 'wavelength—the length of an oscillation in time. It's unfortunate that there are two definitions of wavenumber. Some people reserve the term spatial frequency for the ordinary wavenumber, or use ν (that's a Greek nu, not a vee — another potential source of confusion! ), or even σ for it. But just as many call it the wavenumber and use k, so the only sure way through the jargon is to specify what you mean by the terms you use. As usual! You can use FIJI to compute the 2D FFT of an image. FIJI is a popular open-source, scriptable scientific image-processing tool. FIJI Is Just (a more awesome) ImageJ. Get the software from here. 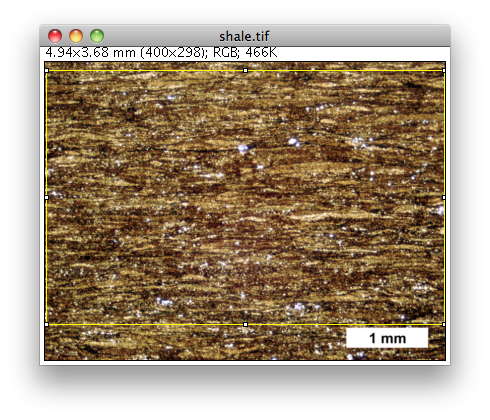 This image is a low-res version of a photomicrograph of some shale from Schieber et al (2010). Please note: This image is not covered by the CC-BY license on the rest of this wiki. It is copyright of the authors. I'm calling the use of a low-res version 'fair use'. I will try to build an example with an open image at some point — feel free to change it! There are two ways: Process > FFT > FFT or Plugins > Process > Fast FFT. The methods are basically the same, just slightly different implementations. ↑ Juergen Schieber, John B. Southard, and Arndt Schimmelmann (2010). Lenticular shale fabrics resulting from intermittent erosion of water-rich muds—interpreting the rock record in the light of recent flume experiments. Journal of Sedimentary Research 80 (1), p 119–128. DOI 10.2110/jsr.2010.005. This page was last modified on 2 May 2012, at 05:53.